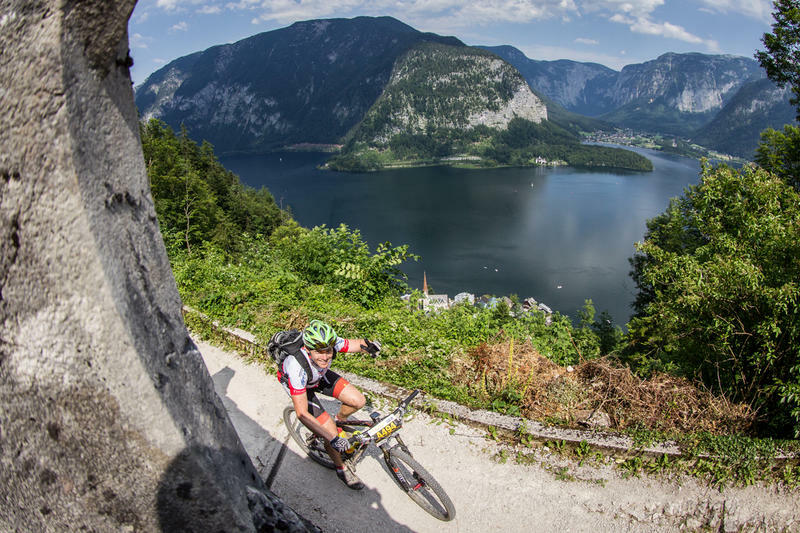 Bad Goisern; Since the first edition in 1998, the Salzkammergut Mountain Bike Trophy has become Austria's largest MTB marathon over the years. In 1998, where there were 220 hard-boiled bikers, in 2017 - the 20th anniversary of the Trophy - 5,062 starters from 43 nations were counted in 11 different competitions. Once hell and back !!! It all started in 1998. 220 hard-boiled bikers competed in the first trophy. 20 of them on the extreme track, but only 10 athletes finished. Throughout the years, the Trophy team has constantly expanded the range of tracks and now offers suitable routes for all performance classes and also for newcomers. This year there are seven different distances to choose from: in addition to the extra distance of 210 kilometers, there are routes over 22, 37, 53, 74 and 119 kilometers as well as the technically demanding "all-mountain" commercial with 55 kilometers. 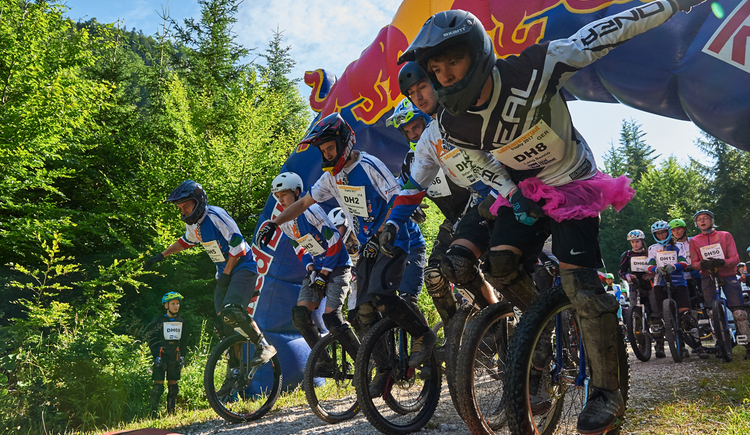 Rounding off the diverse racing offer is the SCOTT Junior Trophy, the unicycling competitions, the innovative Bosch eMTB Challenge and the new cyclocross marathon powered by Dachstein-Salzkammergut! 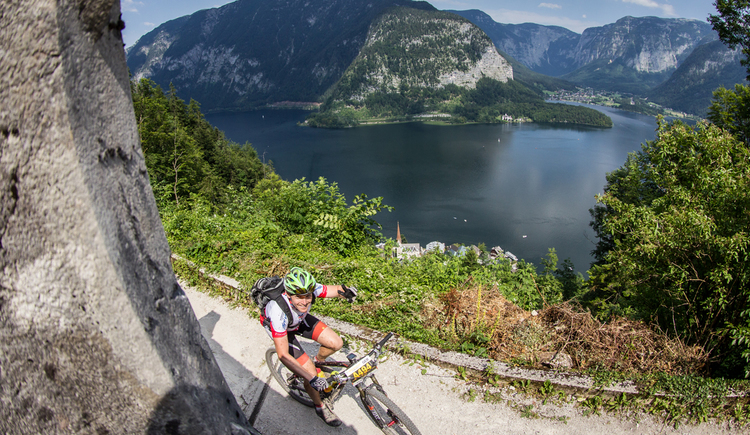 The Salzkammergut Trophy starts at 5 o'clock for the 900 toughest mountain bike athletes. Because it says namely "take the extreme distance" on the marketplace of Bad Goisern. 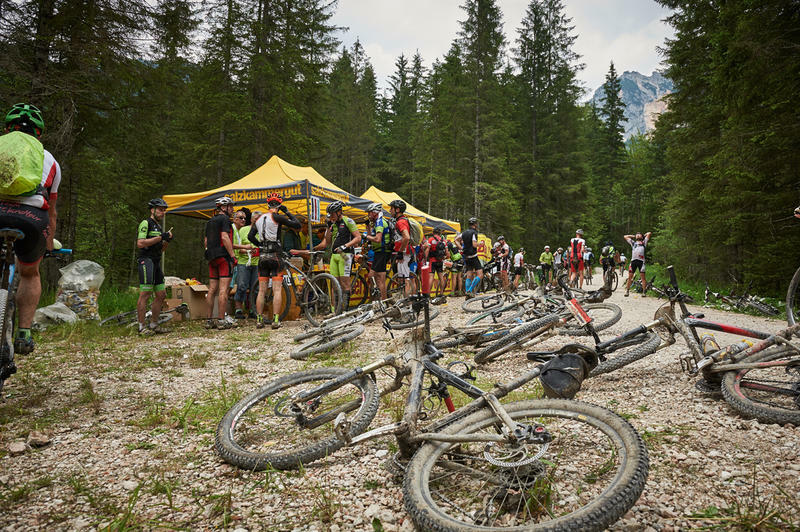 Powerful 210 kilometers and an incredible 7,119 vertical meters will again be in front of the participants of the toughest mountain bike marathon in Europe. The prestigious black finisher shirt of the A-driver has become a cult object! The individual marathon routes of the Salzkammergut Trophy are considered attractive and very selective. In particular, the long loop of the A-riders over 210 km is one of the most impressive in Europe and has already achieved "cult status". In addition to the athletic and mental strength is in demand because of the tremendous efforts that the athletes have to face this extreme distance. Often, the dream for the coveted, black finisher shirt for many only fulfilled in the second or third participation. Therefore, it is not surprising that every year more and more A-drivers are already at dawn at the starting line in Bad Goisern. And for some, the race day comes to an end in the late evening hours, when the winners have long been established. A real spectacle is right at the start of the Trophy weekend. On Friday evening, over 100 unicycle downhiller 500 meters in altitude descend from the Predigstuhl into the valley to Bad Goisern. This sensational downhill has blossomed into a popular fixture in the unicycle scene. 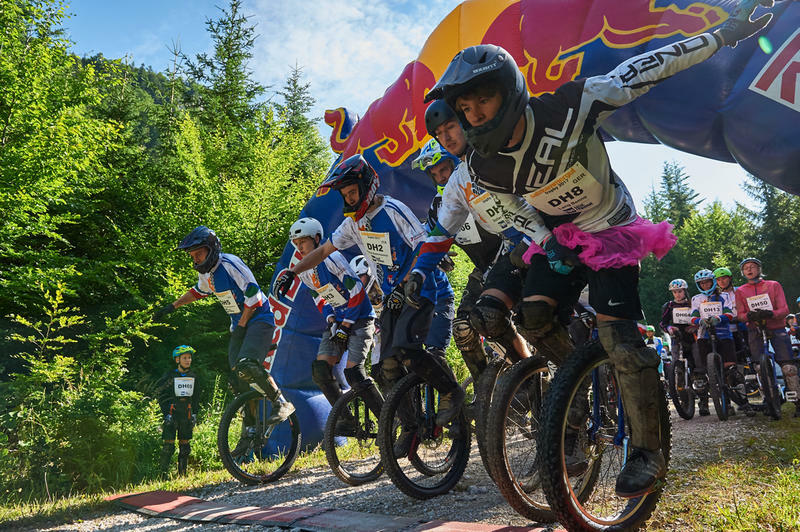 It's going to be especially exciting, as the Austrian unicycle downhill champions will be crowned again this year! SCOTT Junior Trophy - offspring on the bike! The youth competition will be started in the center of Bad Goisern on Sunday, as well as on most of the routes the day before. The kids will have 2 competitions to choose from! Playful in the course - at race pace at XC-Race! The "course competition" is less about speed, more important is the skill! The classification into the different categories does not take place according to the age, but according to the wheel size or according to the abilities of each individual participant in the course the young bikers without overcome all the time pressure various obstacles and playfully prove their driving skills.All children get a start number, but there is no evaluation or ranking in accordance with the Olympic spirit! The "XC Race", on the other hand, is designed for experienced and ambitious young bikers. The start takes place in groups separated by age groups (U7 - U15). Own trophy shirt and gingerbread medals for all Juniors! But whether in the course or at the XC-Race: At the finish all participants receive a gingerbread commemorative medal and a Trophy T-shirt. The children and adolescents will also be rewarded with many great prizes following the award ceremony. The main prizes are a SCOTT mountain bike and a pair of Fischer skis. 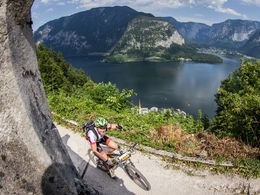 NEW: "Cyclocross-Marathon powered by Dachstein-Salzkammergut"! The organizers are constantly striving to implement new wheel trends through additional competitions at the Salzkammergut Trophy. Fatbikes or tandems have been available on all routes for several years. On the 14th of July there will be an own rating for Gravelbike's. The distance for it is 63 kilometers and 2,076 altitude difference and is almost identical to that of the C-distance. However, the Hallstatt Salt Mountain does not have to be beaten by the "Crossers" in 2018. The start takes place in a separate starting block from Obertraun. 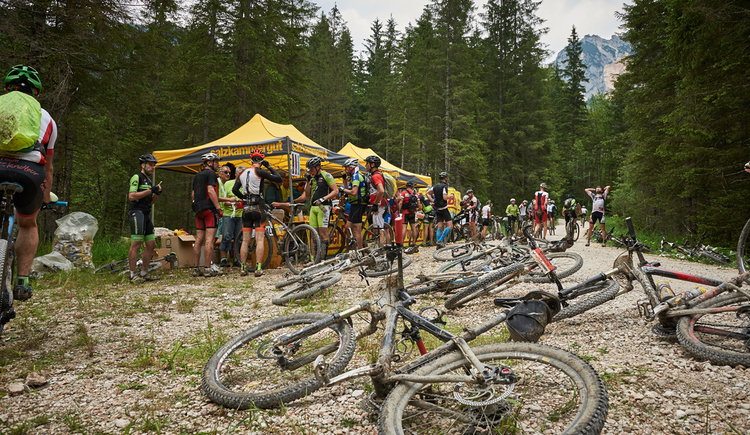 Two-thirds of the "Gravel Marathon powered by Dachstein-Salzkammergut" run along gravel or forest roads and are therefore ideal for cross-country and cross-country bikes. ​"Bosch eMTB Challenge supported by Trek"
After the successful premieres in previous years, there will again be a separate track for e-mountain bikes in 2019 as part of the Salzkammergut Trophy. The start is basically possible in 3 categories. The participants of the "Amateur" and the "Advanced Rating" have to drive six Uphill- and Downhillpassages without prior training on time. In these sections are sometimes different heavy lines to choose from, which are marked in blue and red and can be freely selected depending on driving skills. On the transfer routes in between, 10 checkpoints are approached. The winners will be honored at 19 clock in the marquee on the market square. 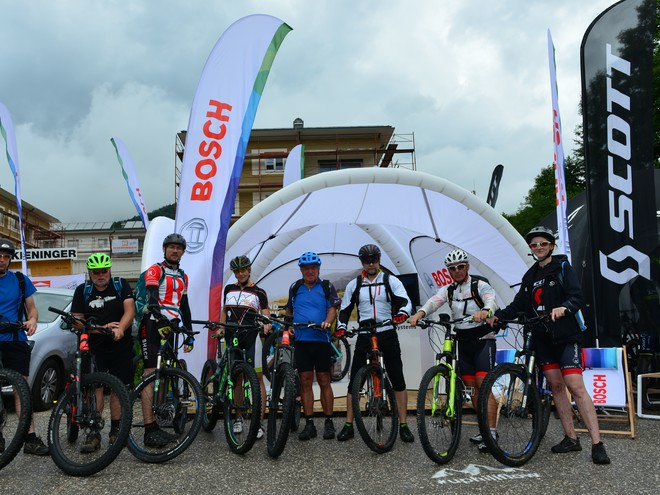 In addition, there is also the opportunity to participate in the "Bosch eMTB Challenge supported by Trek" without time evaluation. The participants of the category "Explorer" have to cover the entire, approximately 30 kilometers long route as a tour, the sections are easily avoided. Despite different levels of performance, families, partners or groups can enjoy the special racing atmosphere together. If you do not have an eMTB yet, you can borrow one for some of the exhibitors. 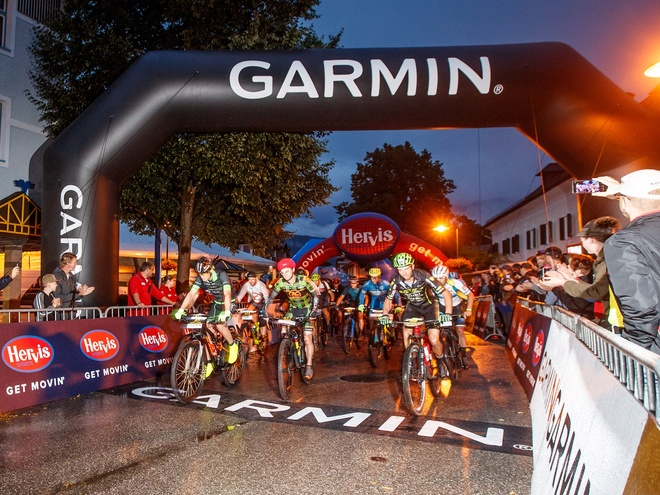 In addition, the "Bosch eMTB Challenge supported by Trek" in Bad Goisern will be packaged into a separate racing series together with the eBike competitions in Riva on Lake Garda (ITA), Solothurn (SUI) and Willingen (GER). eMTB-Testival and guided eMTB tours! During the entire Trophy weekend, there will be the opportunity at the bike fair to test over 100 eMTBs of various brands, on the one hand on a signposted test track, but also on guided tours with local guides. Especially recommended are the sunset ride and the special eMTB driving technique training with the former MTB World Cup driver Greta Weithaler! Supporting program: bike fair, dirtbike show and after-race party! The three event days will be accompanied by the bike fair. 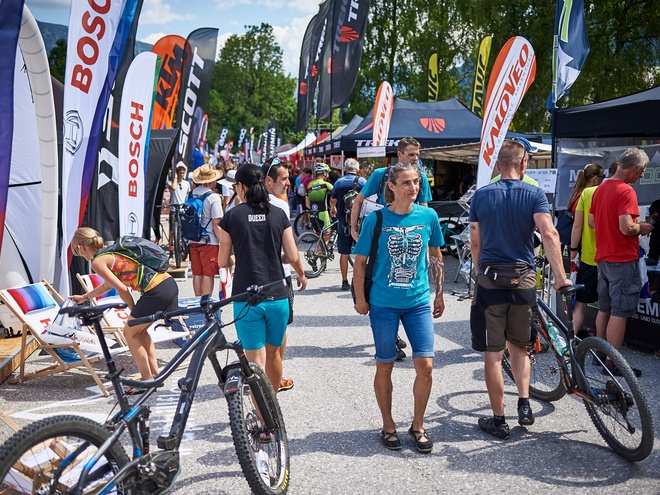 More than 80 exhibitors can provide mountain bike fans with information about the latest products and developments, as well as shopping. At many stands there are special offers and competitions. A tour pays off for all visitors and not just for race participants. At the stands, current test bikes - both mountain bikes and eMTBs - are waiting to be put through their paces. Experienced team mechanics are gathered at the service stands to provide advice and assistance for all visitors to their bike problems. Also represented are numerous clothing manufacturers who present their trendy products. For all party tigers there's a raceup party on Friday evening in the marquee. And after the marathon on Saturday at 11 pm, the legendary "After-Race-Party" starts in the covered courtyard of Schloss Neuwildenstein. The 22nd Salzkammergut Trophy takes place from 12.-14. July 2019. All information and registrations at www.trophy.at!